As of the latest short disclosures, three UK stocks from banking services sector have an aggregated short interest above 5%. 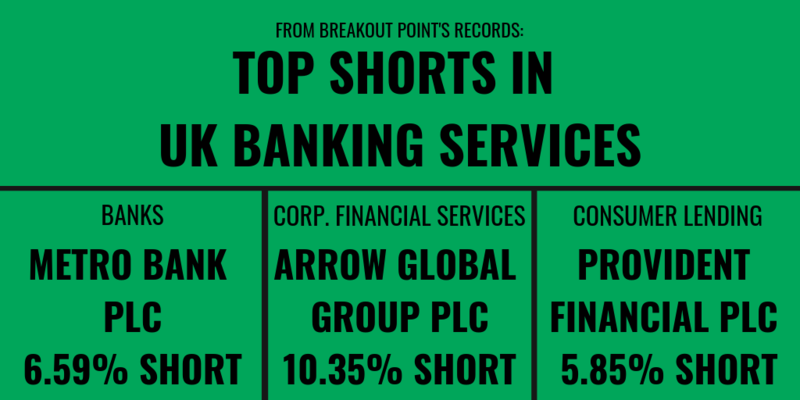 These are: Arrow Global Group plc (10.35% short) from corporate financial services sub-sector, Metro Bank plc (6.59% short) and Provident Financial plc (5.85% short) from consumer lending sub-sector. 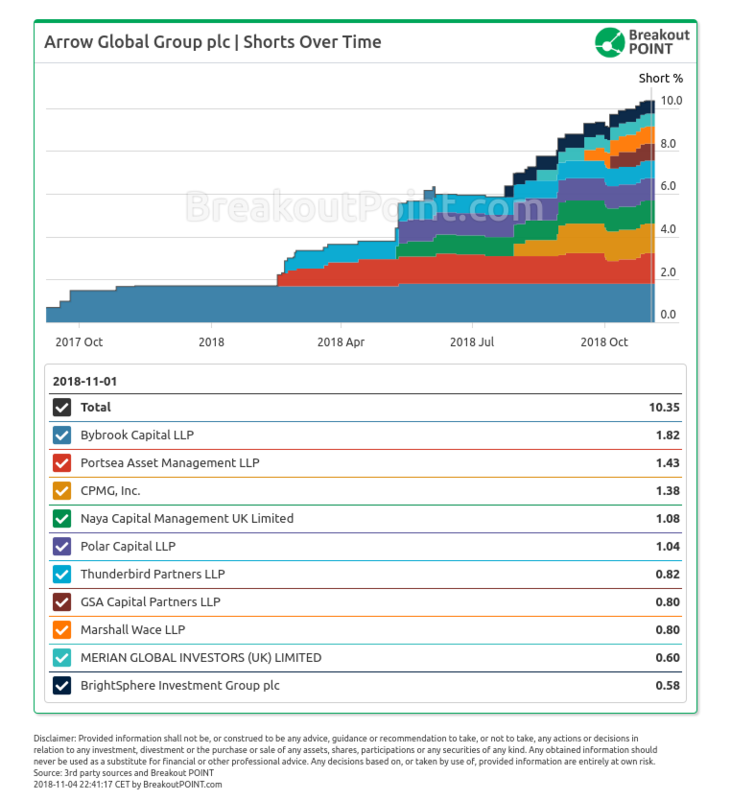 Short interest has been on the rise for the past year in Arrow Global Group (about 6 times higher vs 1 year ago) and in Metro Bank (about 4 times higher vs 1 year ago). On the other hand, short interest in Provident Financial halved in this period. A deeper look shows that, 7 UK banking services stocks have at least one short position >0.5% ("big short"). In addition to 3 already mentioned stocks, CYBG (2.76%), Close Brothers Group (1.8%), Non-Standard Finance (0.81%) and Paragon Group of Companies (0,5%) are on our list. 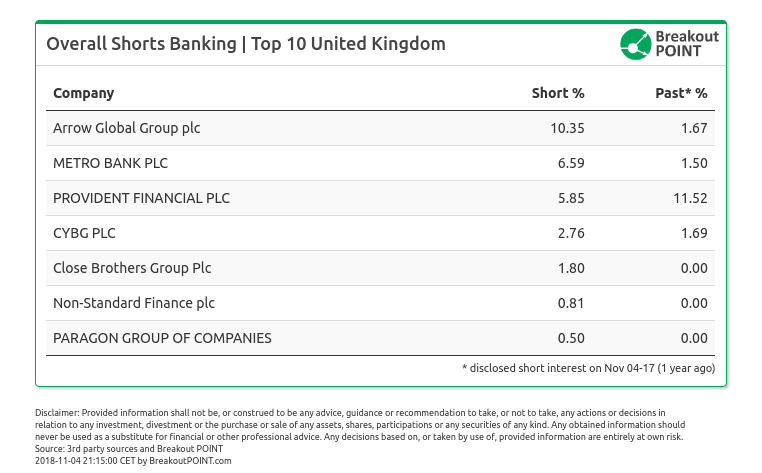 The most big shorts in UK banking services are held by: Marshall Wace LLP (4), BlackRock Investment Management UK Ltd (3) and Polar Capital LLP (2). Such high number of Marshall Wace's short positions did not surprise us, and as we analysed in our "Who Shorted EU?" post, they have by far the highest number of significant short positions across EU, as well as in EU financials sector. A number of other funds holds one big short in this sector. However, Neuberger Berman, investment management firm where Steve Eisman is a managing director, did not appear in our records. 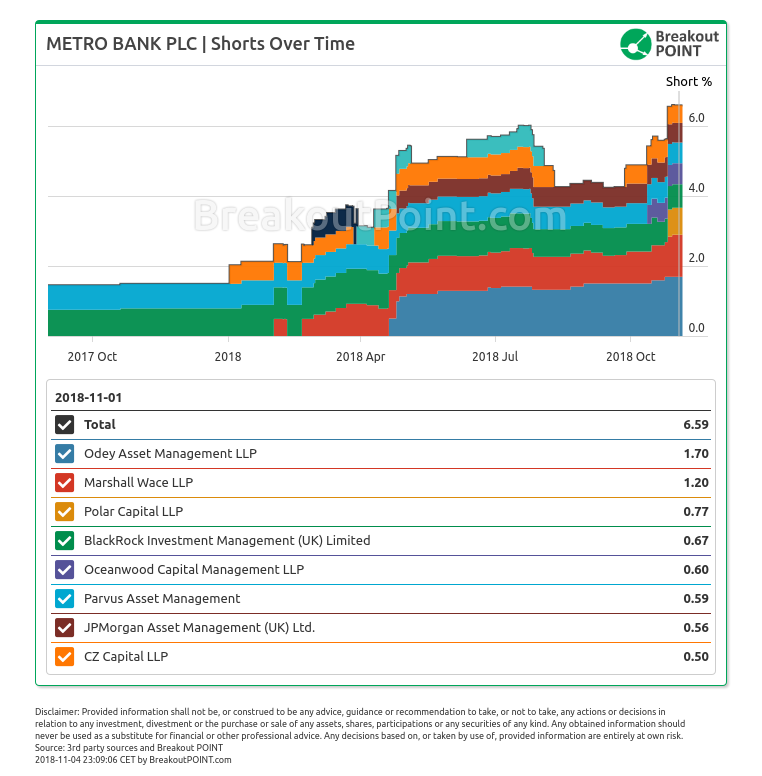 Odey's short stands out among eight big shorts in Metro Bank (market cap about £2.31b). Odey's short position has been publicly disclosed since April 2018 and is currently at 1.7% (about £39m). Ten funds hold a big short in Arrow Global (market cap about £338m). The most peristent short seller, Bybrook Capital, also holds the biggest short of 1.82% (about £6m). Marshall Wace and Polar Capital are the only funds that pop-up with a big short in both stocks. Know what influential investors and activists do. Cancel anytime. Join Breakout POINT. FAQ | Q: Can I publish parts of above data and analytics in an article? A: As long as you reference our work in your article - yes, you can. FAQ | Q: Could you provide further related data and analytics? A: Sure, LET'S TALK and we'll try to help as soon as possible. * Note: Presented short selling data is based on European net short position data which is disclosed to the public when short positions at least equal to 0.5% of company issued share capital. The services and any information provided by Breakout Point or on the Breakout Point website shall not be, or construed to be any advice, guidance or recommendation to take, or not to take, any actions or decisions in relation to any investment, divestment or the purchase or sale of any assets, shares, participations or any securities of any kind. Any information obtained through Breakout Point and its services should never be used as a substitute for financial or other professional advice. Any decisions based on, or taken by use of, information obtained through Breakout Point and by its services are entirely at own risk. Shorts of "The Big Short"